What do writers smell like? This started about a year ago. Well, of course to be honest it started much earlier. It started when I was a student studying at the libraries in various European cities that I passed on my young journey searching for my future path(s). It also started when I understood why my father would buy very old books at auctions not necessarily to read them (for example seven or so versions of Qvo Vadis). It started many times. But also about a year ago. 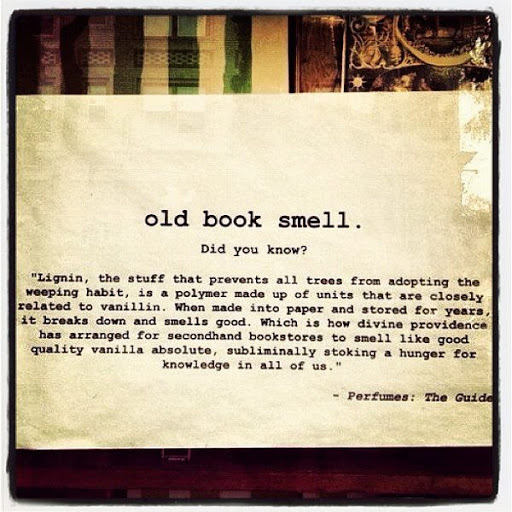 I was talking to my friend, and at that time colleague, Karl about how we loved the smell of books. All the ways in which old printed paper can smell… How it is part of the reading experience and about the feeling of stepping into an old book store. When I read about Dead Writers a few months ago I remembered this conversation. Karl had actually read about this perfume too and had the same association. So – this post is dedicated is to you, Karl. One of the most intellectually rapid and insightfully witty persons that I have ever had the pleasure to be around! So, what happens when a writer starts experimenting with aromatherapy trying to create a remedy for migraines? 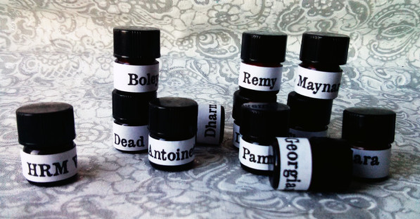 Home of the Dead Writers line of literary perfumes, Sweet Tea Apothecary is a Seattle based micro-perfumery specializing in historically inspired handmade perfumes. About three years ago the owner – writer, journalist and teacher JT Siems started to experiment with aromatherapy to create something for herself that would help her deal with migraine problems. One thing led to the other and soon she found herself crafting scents around the ideas of famous historical people. And one day I stumbled upon Dead Writers while doing some research and had all these lovely associations based on my past and personal references. So I contacted JT to hear more about her thoughts about perfume and the idea with the writers theme! This is what she kindly shared with me. I’ve always loved perfume. That was always the luxury item I wanted. I think I have good body chemistry or something because people tell me I smell good all the time, even when I’m not wearing any scent. Reactions like that are really intriguing to me so I find it fun to kind of play mad scientist and see what I come up with. I also really like hearing people describe my perfume because it’s so subjective – sometimes people come up with stuff I haven’t even thought of. In making my own perfumes and mixing them with writing and learning about other people’s lives, I’ve really found it to be another creative outlet for me. How do you choose your writers? 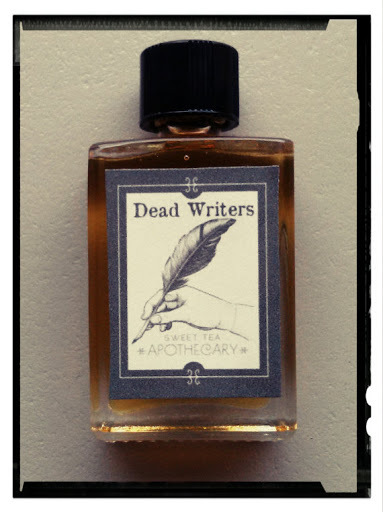 My intention was to have a whole line of writer inspired perfumes but the Dead Writers perfume itself got popular before I could release the others. Right now I’m working on getting those ready. I have an Edgar Allan Poe inspired perfume called Lenore coming out soon and am working on a Zelda Fitzgerald called Zelda and a Jack Kerouac called Dharma Bum. My process for choosing writers is kind of all over the place. Sometimes I have a fully formed idea and I just go for it, sometimes I’m just working on a perfume and say to myself, “Wow that reminds me of [insert writer].” Lenore and Dharma Bum were intentional, Zelda, I was actually trying to make an F. Scott Fitzgerald scent and what I came up with just screamed Zelda. I also think she’s under appreciated so I’m happy to give her the spotlight. Thoreau was also an accident. I like woodsy scents and after I first made that one, the first thing that came to mind was Walden. Is any of your perfumes a favorite of yours? Remy and Georgiana are probably my favorites. I could wear Remy everyday, I just love the honey quality to it and the saffron also gives it this nice spiciness that keeps it from being too sweet. Georgiana is my favorite to wear for special occasions or going out because it has this elegant, sultry smokiness that is subtle yet very memorable. It shocks people to know that I don’t usually wear Dead Writers. 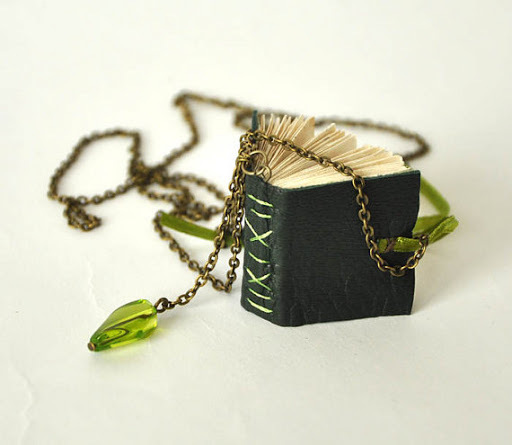 I like Dead Writers but two things prevent me from wearing it. 1. I tend to like lighter perfumes that have tea, floral, or honey qualities. 2. I literally spill Dead Writers all over myself every time I make it, which is very frequently these days to keep up with demand. You categorize three of your perfumes as unisex. What are your thoughts on this, is it necessary or good to separate perfumes into for men /for women? I separate three into men’s / unisex more as an identifier for the men who happen to come looking at my shop. They tend to want to stay away from the florals and the sweeter perfumes so I do it as more of an easy way for them to find something they might like. That said, I love wearing “men’s” cologne and have found that many of the women who visit my shop aren’t at all bothered by the label and feel as I do. Maynard is the only one so far that I’ve made with men in mind, Dead Writers and Thoreau turned out how they did and I heard feedback from both men and women that they liked it. I made Maynard for my husband, but that’s another one I actually really like to wear. Overall, I think if you like a scent you should wear it without worrying about whether it’s perceived as masculine or feminine. We all have different body chemistry and you never know what’s going to sit well on you. Where do your draw inspiration from in the perfume world? Are there any specific noses or houses that you are inspired by? I’m not that heavily involved in the perfume world to be honest. 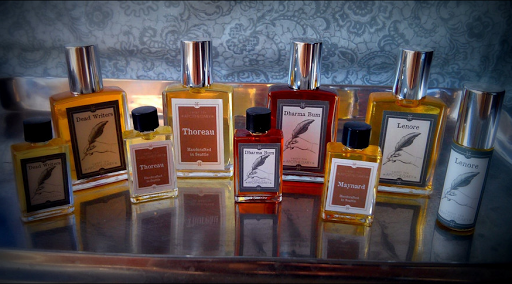 Here in Seattle there’s an amazing indie perfume scene that I’ve met up with a few times. They’re really cool people who are very passionate about making artisan scents. They all have interesting collections that you just don’t find at your standard perfume counter. I would say that this spirit of perfume as artistic creation is what inspires me. Apart from that group of people, I’d say I’m more inspired by the ideas, people, places, specific materials. I went to Paris for the first time about two years ago and just walking around Versailles gave me these intense feelings that became my Antoinette perfume as soon as I got home. That’s my usual process – I read about someone or watch a movie etc, and just feel struck by the emotions in their life and I try to capture it. If money was not an issue, what perfume is your dream to make? If money was not an issue, I would literally buy every kind of rose out there. It’s probably a good thing that I can’t really afford some of them yet because then I’d have rose in every perfume. I would also really like to be able to work with some of the high end chamomiles. I love the smell of chamomile and have so many good ideas for use, but it’s so prohibitively expensive I’d never be able to make it on a large scale. Right now I’m all about the Dragon’s Blood. I love it. Dragon’s Blood is featured in Lenore and Boleyn, my two upcoming perfumes. When I started it was mostly women aged teens through 50s who were interested in the little histories I write for the perfumes, or were just looking for handmade perfume oils. I had a lot of teen customers buying up Dead Writers until it went viral and now, it’s everyone. All ages, men and women. A lot of people have been coming for Dead Writers but end up buying either sampler packs or splurge on something else that caught their attention. I’ve noticed lots of university addresses recently. As far as countries, I’d say the rankings right now are USA, Australia, Canada, and the UK. But I’ve sold all over – France, Spain, Bosnia, Greece, Turkey. It’s so amazing to have people find you from all over the world. I am fortunate to have samples of the entire range. (I really appreciate the not only cute but excellent little sample bottles! Everything stays where it is supposed to be, an aspect that should not be underestimated.) The variation in JT’s range is really impressive. It is a grand adventure and olfactory portrait gallery that she has created with all sorts of guests around the table – some light and romantic, some weird, some stubborn, some philosophers and some kindered spirits. Some seem to have appeared straight from a summers evening and some from a long travel in leather boots (that would be Boynard). Antoinette tries to seduce you, Dharma Bum will give you life advice and Maynard…oh you will want to go on a long walk over the meadows with Maynard. HRM Victoria however – you don’t want to get into an argument with her! I cannot really specify exactly what it is, but I do associate these scents and their complex voluptuous character with reading. They go well with a blanket, candle light and a big cup of tea. Darkness won’t bother you wrapped in Georgiana, the rain will feel cosy scented with Pamplemousse. And the harsh HRM Victoria will keep you safe from harm.